Introduction: Eadmund Ironside died shortly after his agreement with Canute, King of Denmark, deciding the boundaries of his realm. His decease took place on 30th November 1016. The widowed Queen, Ealdgyth remained behind with her two small sons, Eadmund and Edward. Canute’s wicked adviser Eadric, desired to persuade his king to cause the two little orphans also to be put out of the way as their party might cause trouble in the future. Canute, however, was incapable of such an outrage, since after the death of Eadmund Ironside the entire kingdom was already under his sceptre, and he had no wish to sully his name with the blood of children. He dispatched the two boys to Sweden, with the command that the heirs to Eadmund’s throne should be killed there. The King of Sweden (Olaf) was a devout Christian, whose soul revolted at the idea of a murder which the formidable Canute himself had found too difficult to undertake. He caused the two small boys secretly to be taken to Hungary, to the court of Saint Stephen. Presumably they were taken through Russia in 1017 or 1018. The chronicles register nothing more concerning Eadmund and Edward for a period of about forty years. We merely know that the King of Hungary received the Anglo-Saxon princes cordially and educated them with deep affection. Eadmund, the elder prince, however, died young. In due course Edward married. His wife, Agatha, bore him three children: Margaret, Christine and Edgar. The three children were educated in Hungary till 1057 when — after an exile of well-nigh four decades — Edward was permitted to return to England with his family. So much is known of the sojourn in Hungary of the sons of Eadmund. Nowhere can we find contemporary records of the manner in which the Princes came to the court of the King of Hungary, who brought them, whether accompanied by their mother or not, whether they were in communication with anyone in distant England, where, in 1054 only, did attention towards the surviving Edward begin to be apparent. For, in the meantime, the tempest of events had swept across the whole of England. Canute the Great and his family had become extinct. 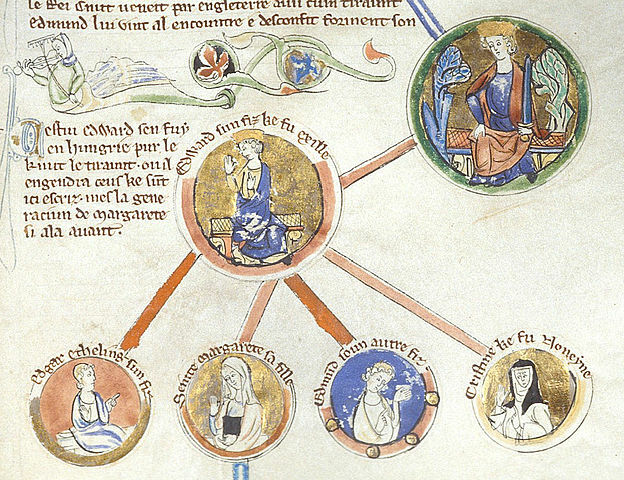 In 1042, after long years of exile in Normandy, Edward the Confessor came to the throne of England. But Edward the Confessor was without issue and again the English throne lacked an heir. Incalculable tempests and dangers awaited England once more. Then, in this anxious time, attention was called to the Prince living in the far-off land, in Hungary. The head of the national party, Aldred, Bishop of Worcester, went to Cologne as ambassador to Henry III Emperor of Germany with the request that he should negotiate with the King of Hungary for the return of Prince Edward and his family. Bishop Aldred was received with pomp and splendour in Cologne and detained there for about a year. Finally, however, he was obliged to leave the city without accomplishing the task he had undertaken.1 No records betray the reason why the powerful Emperor of Germany did not comply with the request of the King of England. It is possible that he cherished certain secret aims of his own in Hungary with regard to Prince Edward. Be that as it may, the English prince and his family did not reach England until 1057 after the death of Emperor Henry III. Since his return we find much more information concerning the fate of this royal family.